Open fire= I don't think I am going to see the 100 Monkeys. They will be closer to me again. I hate to ask my friends to watch the kids so I will wait to ask a friend until something better comes along. I am lucky my husband is off for the Premier. I am so exausted today. I let people get to me lately I can't even get into my mom on this subject in detail, but a short version is in the land of twilight my daughter has been in the paper and people mag and my mom hated that because of predators, I never used to get my pic taken with cast and then I did for two or three actors and my mom heard about it and doesn't like that, and my mom started going around saying that I chase the cast. She doesn't like I have gone to the today show. Then she read in the paper how twilight is breaking up marriages so you put all that stuff together with the breaking up marriages and my mom connected invisible dots. I am so exausted today thinking about people that just don't think before they act. I guess my mom forgot that lesson she taught me. Anyway, so I don't think this time, but I will see them again. susie, It sounds like you have had some great birthdays. I would love to sing at mine too. That isn't my husband's style though. I am just going to play some cd's and scream surprise. I think it is going to be nice out so I am hoping so. That way people could spread out. Any suggestions? I have never had a party for an adult before. Caryn, I’m sorry your throat is still sore…it’s almost weekend, maybe you can have some time to recover than…. Dawn, that you can even focus on what song is playing when Robward is walking like that…I couldn’t even if I tried…my mind is more focused on the incredible show of the male body…if I were a teacher I would use that to discus male anatomy and movement of the two legged creatures…. Just a quick drive by post. I know I promised to post to reply's last Monday but alas RL got in the way again. Life at work gets too busy again. Also my mom is in town for this week. Its her monthly check up with her diabetologist. She had all sorts of laboratory tests tomorrow. We're praying that its all within the range of normal. Anyway I still have a few minutes before I get off from work, better start clearing my desk. Dawn~ Aww, that’s sweet. I’ll keep my fingers crossed that it stays a surprise!! I honestly laughed out loud when I read that your mom has read articles that say Twilight is breaking up marriages. Good gods! See, this is what happens when someone doesn’t pay attention to the underlying issues. Not to mention they have no concern for the utterly wrong ideas that it gives people about The Saga. I’m not even going to bother commenting on the amount of stupid it takes for someone to write such utter bunk! Jaclyn~ “Spread the Pretty” Oooh, that’s just sounds dirty! Please forgive my gutter-bound brain, but I seriously almost spit my Diet Coke! Thanks. It’s getting there. At least today, it’s consistent. The last two days, it’s kind of gone in and out. Today, it’s strained and quiet, but at least I have a constant tone, so people can understand me better. Susie~ Unfortunately, the meditation corner is single occupant only… well, single occupant and eRob! We just got really good at sharing! I soooo love your brackets!! Your reasoning is sound and logical. I will love to see it if it happens!! Well, no one said I couldn’t talk… people just can’t hear me when I do! I still do my damndest though! Most frustrating is when I have to get the boys attention. It’s the perfect excuse to totally ignore me. You can bet about how well THAT goes over. Marielle~ HA!! Time to recover? No such luck. Littlun has a soccer tourney this weekend and I will likely be cheering myself more hoarse! I just can’t help it. I’m not good at being quiet. It just isn’t in me. I don’t mind at all. As long as there’s actually no pain involved, or sickness, my voice can be as hoarse as it wants. I make it work. Raine~ I’ll keep my fingers crossed for your mom. Funny O the Day~ CW was asked via Twitter about the first thing he thinks when he thinks about the Twilight cast. His answer? “Directing 7 Cullens at once=herding cats” That seriously had me Outside of the fact that I can totally see it being the literal truth and just a sight to behold, I use that phrase all the time and I love seeing some of my regular crazy infiltrate the universe. Hence the new siggy phrase. Well, I'm off to catch up on the livestream of Butler's game. This is soooo frustrating. It's on TruTV, which is some random cable station, so I can't even check updates on our TV in the library. Grrrrrr!! Here's my Irish Blessing for you, lassies. 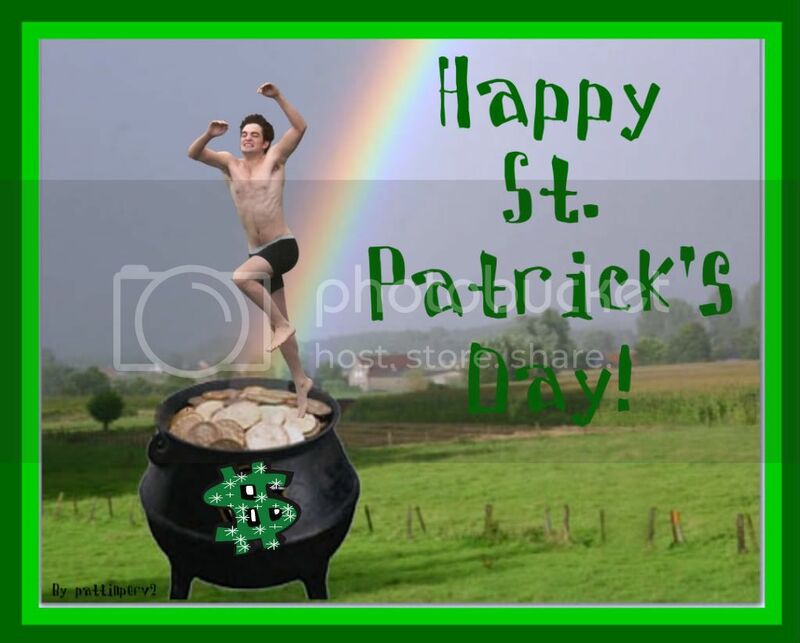 May you always find this little leprochaun jumping out of your pot o gold! It's nearly Friday!! Time to do our HappyDance - whoop! Actually, this week at work has been pretty good but I am looking forward to not worrying about going to bed early so I can get a few hours sleep due to my annoying sleeping pattern atm! Do any of you have exciting plans for the weekend? Susie - Glad I made you gasp out loud with the picture yesterday - I done the same thing when I first saw it!! He is extra gorgeous in that one isn't he?? Dawn - Sorry your mom doesn't have a good view of Twilight Has she ever saw the movie or read the books? Do you think she would want to give it a chance? Btw, I didn't know Twilight was breaking up marriages! If anything I would have thought it would have made people want to work harder at their relationship, to get that level of love shared between Bella and Edward. When is your hubs birthday? I am sure he will enjoy his party no matter what you do! Marielle - Sorry you spilt milk on your St Patricks outfit this morning! I didn't wear green either. I don't really have that much green clothes actually LOL. Did you go off to the pub tonight? I hope you had a great time if you did! Raine - Thanks for checking in! I hope everything goes ok with your mom's tests tomorrow. Hopefully see you over the weekend! Caryn - Haha, I loved that you changed your font to green today! Hahahaha, sorry I almost made you spill your juice LOL. Yep CW is just hysterical on twitter. And so sweet to continue to answer questions!! Aww! No time for RobCrack as gotta run - catch you all tomorrow!! I'm taking next week off work because it is Sonny Boy's Spring Break (mine is the following week) so I had to do all the prep for the substitute teacher - Yikes! I'm done now, but no time to post until later at home. Time to assume my motherly duties now which involve taxi service, grocery shopping and cooking dinner - not necessarily in that order. Trine ~ Hellooooo it has been too long! Yeah, its so horrible. 200 and something dead and the city is completely trashed! I'm watching the Memorial service on tv right night. Prince William is there, and he spoke *fangirls*. I'm glad to hear you're okay too! Whats new? Susie ~ Nice to see you again too. Tracy ~ Hey bro! Whats new?? And hello and hugs and to everyone I didn't mention and to all the girlies that have joined whilst I have been gone. 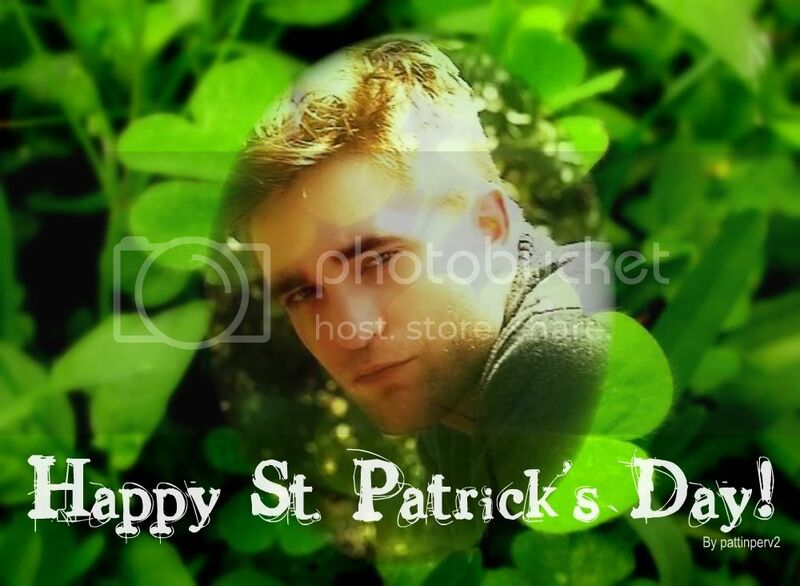 And to everyone who celebrates St Paddies day HAVE A GOOD ONE DONT GET TOO SLOSHED! HAPPY ST. PATRICK'S DAY, SISTERS!!! I hope Ya'll are not upside down and side ways in your green beer at this moment! I celebrated the evening with a mani & pedi. I hate to post and run, but I need to head over and check on messages at FB before getting myself to bed. Tomorrow will be a long day. It's Daddy's 71st birthday, and the Partridge family is getting together tomorrow night to celebrate with him. Then, my little sister Leah and I may head over to a place near my house called THE BRICK to hear a band that my cousin sings lead vocals for. So, it may be a late night. If I don't see Ya'll tomorrow night before bed, I'll see you on Saturday. Had to had to had to switch back to my blue, which today is Butler Blue!! Dawgs win!! It was everything an 8-9 match up should be; back and forth the whole game, well played and hard fought. But, in the end, my boy Matt came through with a spectacular hustle play that knocked it home when it counted most. So, now, it's on to face #1 seed Pittsburgh. We're a severe underdog. But, that doesn't bother the Blue Nation. We were underdogs against Syracuse last year. Same thing with Michigan State. And everyone figured Duke would blow us out by 20. So, we've got no problem. That's where our dawgs are most comfortable. Tracy~ *hugs* Sorry darlin'. It's been an interesting tourney already, and it looks like your boys fell to that phenomenon. Tonise~ Happy birthday to your dad! Have so much fun with the family. Jadey~ Of course we think about you! You're an unforgetable force, bb. Most recently, I wondered what your thoughts were about Ms. Kris being cast as the original damsel in distress, Snow White. I'm thinking she'll get a bit of an attitude adjustment from our girl. Susie~ A week off sounds lovely right about now. Enjoy!! Jaclyn~ At this rate, he's the only reason I've considered getting a Twitter account. I'm resisting still though. Caryn, hihi, I can just imagine you cheering at the sideline…your kids do have a lot of soccer tourneys, is that normal in the US? Here in Holland even the kids play in a competition and have to play one match a week through out the year, tourneys are only a few times a year. I don’t have much green clothes either that’s why I was so bumped that I spilled the milk…Last night when we decided not to go out we watch the Ranger making difficulties for the Dutch team…did you hear anything about that? Jadey, nah, you don’t have to worry about being out the loop…we gained some new members and we follow the news topics a bit but besides that the main topic is still Rob and everything related to him…Bash the papz for harassing him, bashing MR for screwing up scripts, bashing CH for not shut up about Robsten and drool over pictures…it stayed pretty much the same…. I’m really happy you are alright…we were pretty worried. Anything new in your life? Susie, any plans for spring break? Hihi it looks like the Cullen parents are getting into the medical profession…Mrs. Cullen and Dr. Cullen don’t they look cute….